On the one hand, the explosion of merchandise related to Batman 66 is welcome after years of the show being unfortunately shoved under the rug thanks to licensing disputes - but on the other, dear god look at these things. 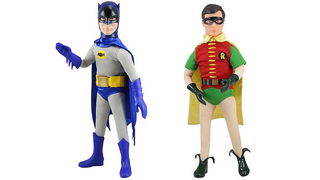 These plus-sized (17" tall) dolls kick off later this month with Adam West's Batman, joined by Robin in June. Aside from the suitably retro aesthetic, right down to the slightly oversized and very creepy plastic heads, the poseable dolls also play soundbites from the show when you squeeze them. I genuinely hope that Batman gets 'Some days you just can't get rid of a Bomb!' and that all of Robin's are just variations of his 'Holy x, Batman!' catchphrases. I mean, that's what you're here for right? Each doll will cost $40 and can be pre-ordered at Entertainment Earth. But honestly, can you put on price on petrifying nostalgia?